During an interview at Joe Hand Boxing Gym after his training, Vitor Belfort was asked if he’s thinking of earning another UFC championship belt. In 1997, Vitor Belfort won the UFC Heavyweight Championship at 19 years old. Then in 2004, he became the Light Heavyweight king. And if he could capture another title before his career is up, Vitor Belfort could boast of earning titles in three different decades. But to do that, he must get past through Yoshihiro Akiyama at UFC 133. 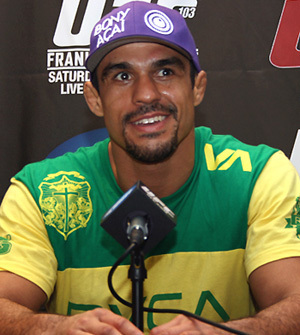 Moreover, Vitor Belfort is also looking for a rebound after being knocked out at UFC 126 by Anderson Silva. If Vitor Belfort emerges victorious, he will have the reason to think of fighting for a title once more. But as of the moment, just like what he said, it is still a climb.